We have managed to negotiate a fantastic deal on the "Rolls Royce" of trampolines. 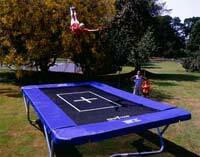 Super Tramp Trampolines are Trampolines available in the UK today. Their range includes round trampolines such as the Super Tramp Excel 12 and 14 and rectangular ones the Frog, Prince 18 and the King 110. They also offer their performance range of trampolines the Wallaby, Super Wallaby, Kangaroo, Super Kangaroo and the unbeatable Boomer. Super Tramp have been developing trampolines now for 23 years. They are the only trampoline company in Europe that covers all sectors of the trampoline market from indoor fitness, outdoor fun, to professional gymnastic trampolines. Their superb range of trampolines is the result of their unrivalled expertise in trampoline design and manufacture. High specification materials are used throughout and the impressive range caters for all ages and abilities. What makes Super Tramp trampolines special ? They use high quality steel wire for the super tramp trampolines springs which is pre-galvanised for absolute corrosion resistance. Up to 30mm thick cross-linked closed cell polyethylene foam is encased in 600gsm (18oz) double sided pvc coated nylon to make their frame pads durable and safe. Their trampoline beds are UV stabilised woven black polypropylene mesh, and are all marked with a central white cross for added safety. Their bed anchor triangles are either galvanised steel, or UV stable injection mouldings on the super tramp trampolines.